Greece is bordered by the Aegean Sea to the east and the Ionian Sea to the west. The seven islands of the Ionian group (Corfu, Paxos, Lefkas, Cephalonia (Kefalonia), Ithaca, Zakynthos (Zante) and Kythira) were under a Venetian occupation for almost 600 years until 1797. Then, after a 75 year period of French, Russian and British protection, the islands became reunited with Greece. The Venetian occupation had some of the greatest influences on the agriculture, language, society, architecture and food of the islands. Each island has a unique charm and character but each has been given a landscape of rich green valleys of olive, pine and cypress; tall village houses, painted in pastel colours of ochre and deep raspberry; terracotta tiled rooftops; balconies with artistically shaped iron railings; bell towers, arches and colonnaded squares. Cephalonia (Kefalonia) is 60 miles south of Paxos. The stretch of south coast between Argostoli and Scala has a series of sandy beaches below the foothills of Mount Aenos. An interior of olive groves, vineyards and pine forest contains small villages and dramatic coastal views. 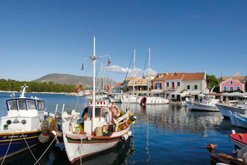 Fiscardo, near the northern tip of the island, has a waterfront of brightly painted Venetian houses, shops, bars and tavernas. Nearby east coast beaches face the cliffs of Ithaca, which turn pink as the sun sets. Corfu will appeal to most tastes. A coastline of beaches, small and large, sandy and pebble, lined by sun loungers or left to nature. A rich interior of farmland hiding small hamlets with olive and citrus groves. Here you can find waterparks, international cuisine, M & S, ginger beer and Marmite but also mountain escapes, beautiful interior landscapes fringed by olive groves, romantic waterfront tavernas, clear seas beside a coastline of cypress trees and delicious local dishes. 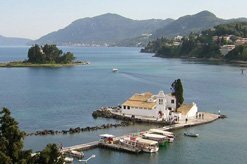 Corfu Old Town has a 16th Century fortress; tall Venetian houses with flaking pastel plaster; a maze of cobbled shopping streets; fruit and fish markets; simple and sophisticated restaurants; the people-watching bars of the Liston beside the cricket pitch and an exciting hustle & bustle. Ithaca, the home of Homer's Odysseus, lies a few miles off the north east coast of Cephalonia. There are only 3 island ports - Vathy (the capital), Kioni and Frikes. 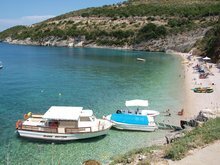 Ithaca offers undulating, natural landscapes of olive groves; a coastline of many deserted beaches - best explored by boat; ancient monasteries and a simple lifestyle shared with a friendly community. 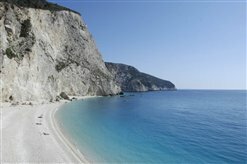 Many say that the sandy beaches of Lefkas' west coast are the best in Greece. From Lefkas Town at the northern tip a coast road passes a string of seaside villages until the pretty bay of Sivota in the south. The many inland villages inland hide away on forested hilltops overlooking fertile valleys of olive groves and vineyards. 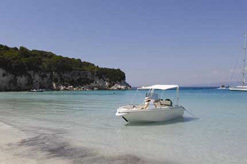 A holiday on AntiPaxos will provide a unique escape with beautiful surroundings. 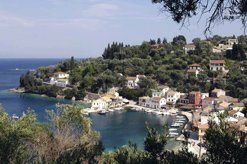 If you are tempted by this, bear in mind that the island has no little ports like Paxos where you can stroll down of an evening and enjoy a waterfront drink or dinner and people-watch. If you and your partner or family really do like eachother's company then AntiPaxos will tick many boxes. The island of Zakynthos, also known as Zante, has many faces. In Laganas you can find beachfront hotels, apartments and music bars with crazy golf; in Vassilikos you can find an undeveloped coastline of pine forest and olive groves; close to Agios Nikolaos, on the north east coast, an undulating landscape of forested hillsides hide some of the swankier island villas. Meganissi is special, simple, laid-back and beautifully small. Hiring a boat is more fun than hiring a car and will give ease of access to the island's many beaches - although a few of our Meganissi villas are a bit of a distance from a village. The Ionian islands tend to have the most rainfall in January and February. From May to November the days are long and warm to hot. South of the Mediterranean Spring can start early March and by May, when the days are getting warmer, there is still a profusion of wild flowers amongst the olive groves. The flashing lights of fireflies, normally a night time phenomenon in June, can often be seen in May. In June the sea temperatures are kinder and one is aware of more locally grown fruit in the shops. Summer school holidays mean more families visiting the islands mid July to late August when temperatures can be high. September – the islands relax after their busy summer height and the temperatures start to soften. October can be the best month for walkers with a milder climate and once again the olive groves start to produce richer shades of green with occasional rainfall.